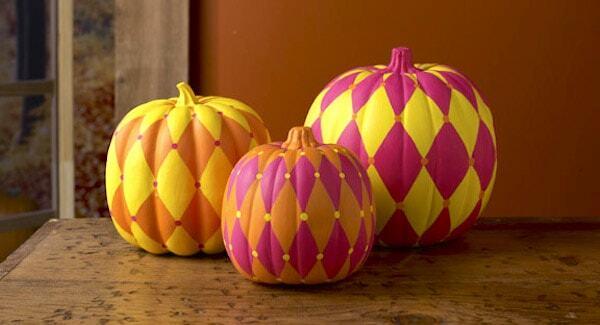 These awesome harlequin painted pumpkins are so easy to make – the perfect last minute DIY project for your Halloween or Thanksgiving decor. Do you love pumpkins? 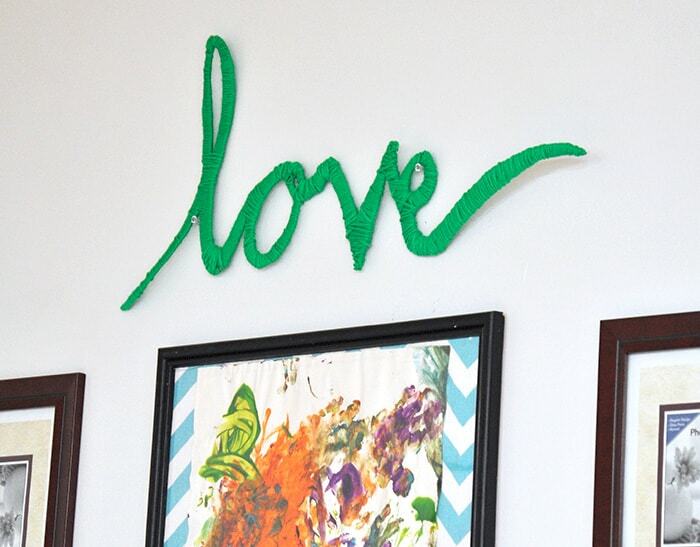 Who doesn’t, right? Here are some interesting DIY painted pumpkins that you’re definitely going to want on your Thanksgiving table. 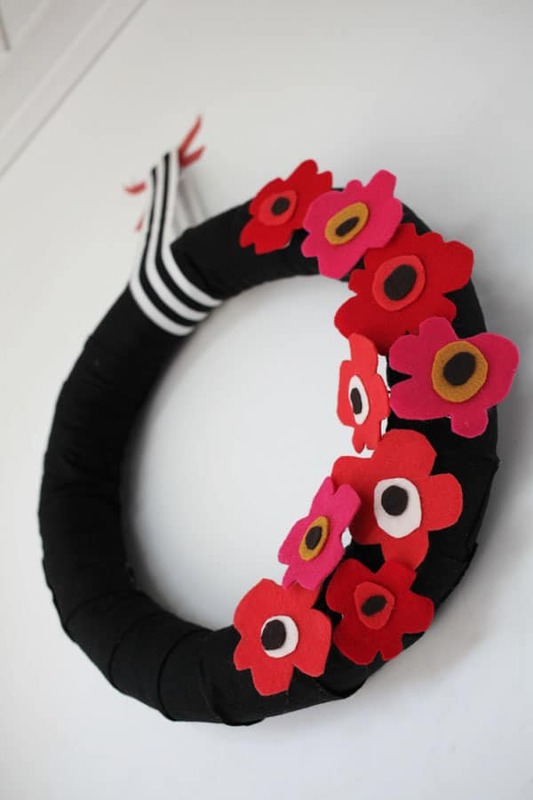 They are made using faux pumpkins (also called “funkins”), some paint, and rubber bands. Get the instructions below. But before that, I do want to give you a little tip – craft stores always have coupons online or in their smartphone apps, so don’t forget to download one before purchasing the faux punkins! Of course you can always paint real ones as well . . . I’ll leave that up to you. Paint the large pumpkin Daffodil Yellow, medium pumpkin Vivid Orange, and small pumpkin Brilliant Pink; allow to dry. Place one rubber band each evenly around center of pumpkins (horizontally). Place 12 rubbers bands each evenly around pumpkin across stem and around the bottom (vertically); each pumpkin should be divided into 24 sections, 12 on upper half and 12 on lower half of pumpkin. Using pencil, draw three elongated diamonds (in columns) in each of the 12 sections to create a harlequin pattern; begin in the center using the rubber band dividing the pumpkin in half as your guide for the middle diamond in each column. 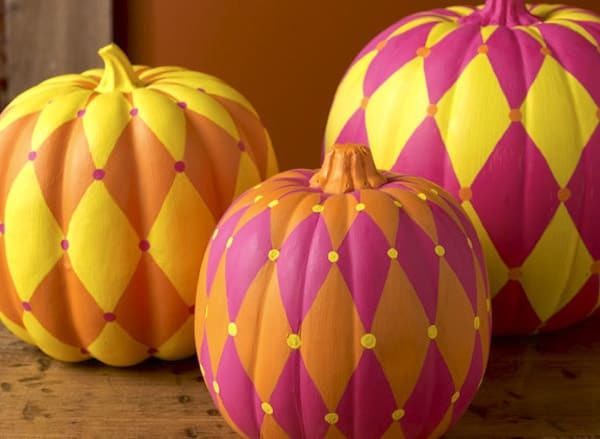 Paint the diamonds on large pumpkin with Brilliant Pink, medium pumpkin with Daffodil Yellow, and small pumpkin with Vivid Orange; give them a second coat if necessary. Paint dots between the diamonds on large pumpkin with Vivid Orange, medium pumpkin with Brilliant Pink, and small pumpkin with Daffodil Yellow. Paint the stem of large pumpkin with Brilliant Pink, medium pumpkin with Daffodil Yellow, and small pumpkin with Vivid Orange. Now display your awesomely painted pumpkins with pride!